Apexification is a treatment used to seal an open apex. The apex is the bottom part of a tooth’s root. Your teeth have tiny passageways called root canals. An open apex occurs when the root canals are not closed. Open root canals can lead to pulp exposure and infection. Pulp is the soft substance inside of your teeth. The pulp may be infected if an opening in the tooth allows bacteria inside. An open apex may be found in teeth that are not fully developed. An open apex may result if the root ends are eroded away by a process called resorption. Trauma may also cause an open apex. 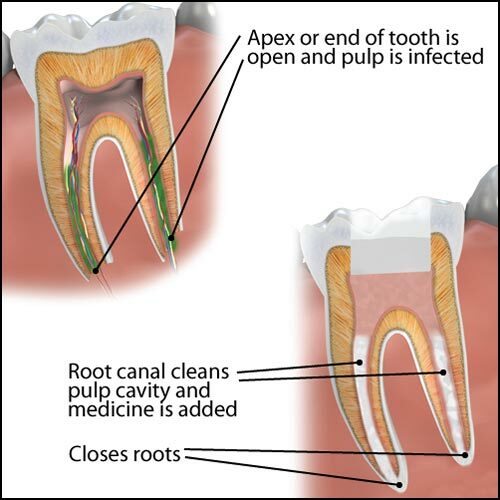 Ordinarily, pulp infections are treated with a root canal. An apexification is necessary if an open apex makes it too difficult to seal the root end with traditional root canal procedures. 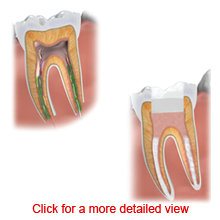 An apexification is a procedure that is used to form a hard barrier at the end of a root with an open apex. Symptoms of pulp exposure include sudden pain or continued pain. Your tooth may be extra sensitive. It may feel loose or unstable. Your tooth may look discolored. Your dentist can diagnose an open apex with a thorough dental examination. Your dentist will compare the roots of your teeth on X-ray films and may perform some simple diagnostic tests. Your dentist will refer you to an endodontist, a dentist with special training in tooth and gum disease, for an apexification. Your endodontist will numb your gums surrounding the affected tooth so that you will not feel any pain during the procedure. You may be sedated as well. Your endodontist will use a very fine drill to create a small hole in the top or back of the tooth to access the pulp. Your endodontist will remove the infected pulp. After the root canals are measured, they are cleaned with special instruments. Medication is placed in the root canals and the tooth is temporarily sealed. The medication will be refilled periodically. The medication typically is replaced every two to four months. The number of treatments varies among individuals. Your endodontist will let you know what to expect. When a root end has formed, the treatment is complete. You will most likely return to your dentist to have the tooth permanently sealed with a crown or restoration. It is important to attend all of your appointments. Apexification relieves the symptoms of infected pulp.